Atheists get to be non-believers for many reasons, but perhaps the most common is finally getting around to reading the nastier and dumber parts of the Bible. What they find there is an enormous number of outrageous stories, contradictions, and head spinning incoherence. The guys who pulled these texts together into the “official” canon provided all the evidence anyone should need to know that the Bible is not the work of a perfect god but of primitive men. Had those men done their selecting and editing a little more carefully, they might have fooled a whole lot more of us. But as they stand, those texts, over and over, make the sensible reader want to just scream, “Are you kidding me? !” In this vein, the “Jesus is god” story is one of my favorites. In standard Christian teaching, Jesus is god. This dogma is expressed in the trinity concept where god, Jesus, and the Holy Ghost are thought to somehow be one entity in a kind of “new math” where 1+1+1=1. 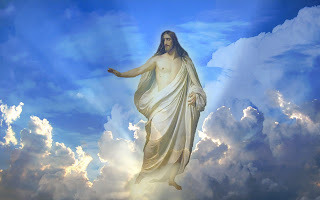 There is also support for this Jesus is god concept in several passages of the New Testament. For example, in John 14:9, Jesus says, “Anyone who has seen me has seen the Father! So why are you asking me to show him to you?" Also, in John 10:30, Jesus says, "The Father and I are one." Now that statement looks to me to be pretty definitive as to Jesus’ opinion on the matter; short and sweet and in unequivocal language. So far, so good. But, with the Bible it’s never that simple of course, so, not surprisingly, there are confounding passages such as Mark 10:17 where Jesus says, “Why do you call me good? No one is good except God alone." Nevertheless, all (or nearly all-) Christian factions insist that Jesus is god. And, if we take them at their word, we get a wonderful “Are you kidding me? !” moment in Matthew 26. In that chapter, as Jesus is about to be taken into custody, a disciple brandishes a sword, but Jesus tells him to put it away and says, “Thinkest thou that I cannot now pray to my Father, and he shall presently give me more than twelve legions of angels?” So, if Jesus is god, isn’t he speaking here of praying to himself? Doesn’t all this suggest that Jesus was mistaken, and perhaps delusional? He says things that are obviously not true about prayers being answered, and even proves them to be false when his prayers don’t even work for himself. Yet, he is supposed to BE god himself! The alternative is that those guys who wrote those texts did so without any godly assistance and screwed up badly in sending mixed messages. Either way, the Bible is utterly incoherent when it comes to the question of whether Jesus is god! Yet, Christian leaders, across the board, insist that the essential Christian message is clear and binding. Are you kidding me?! ExChristian.Net: Jesus is God. . . Are You Kidding Me? !